The largest impact structure with visible evidence on Earth's surface. Vredefort Crater cross-section: This cross-section shows the structure of the Vredefort Impact Crater at a time shortly after it was formed. The rocks of the Witwatersrand Basin, Ventersdorp Lava, Ghaap Dolomite, and Pretoria Subgroup were originally deposited in a nearly horizontal position but were folded and deformed by the impact. The blue horizontal line represents the present land surface, which was produced by deep erosion of the crater. Rocks of the Karoo Supergroup were deposited after the impact and hide the southeastern half of the structure from today's surface view. This image was created by Oggmus and is used here under a Creative Commons license. Map of Vredefort Crater: Map showing the approximate footprint of Vredefort Crater in the country of South Africa. The dotted line marks the approximate location of the original crater rim, which has been obscured by erosion in the northwest and covered by sediments in the southeast. The feature marked "Vredefort Dome" is an area of uplifted strata in the center of the crater. This image was created by Oggmus and is used here under a Creative Commons license. What is the Vredefort Impact Crater? 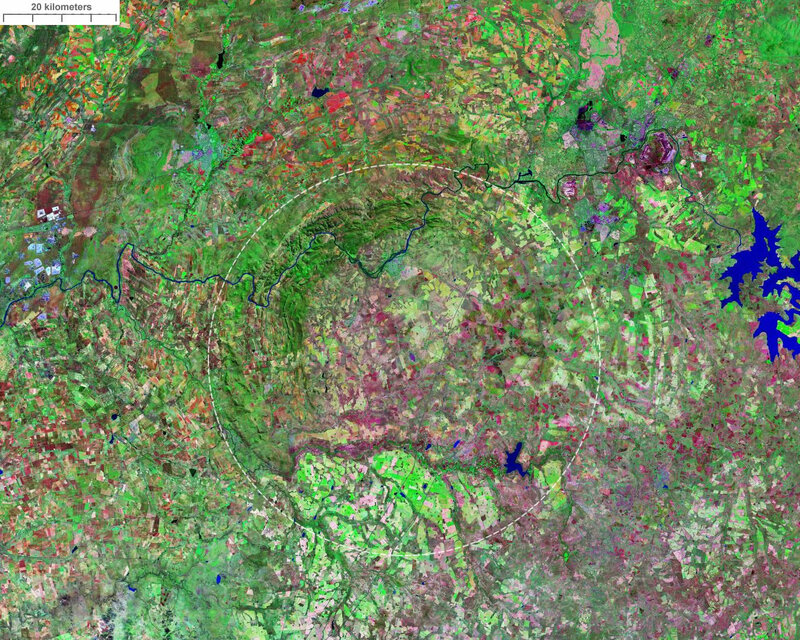 The Vredefort Impact Crater was formed when an asteroid struck Earth about two billion years ago in an area that is now the country of South Africa. At the time of formation, the crater is believed to have been about 300 kilometers across. Since then, the crater and its ejecta have been removed by weathering and erosion. The visible evidence that remains today includes: A) deformed rock units that were once below the crater's floor; B) small-scale impact evidence such as transformed mineral structures and shatter cone structures; and, C) a dome of uplifted rock that once formed a central peak within the crater. With an estimated original diameter of 300 kilometers, the Vredefort Impact Crater is the largest asteroid impact structure that still has visible evidence at Earth's surface. It is also the second-oldest impact structure with visible evidence at Earth's surface. Only the Suavjärvi Crater in Russia is older. What is the Vredefort Dome? A core of basement granite marks the center of the Vredefort Crater. This core is surrounded by inclined rock units that dip away from the granite core in all directions to form a structural dome. This dome-shaped feature is about 70 kilometers in diameter and is known as the "Vredefort Dome." Dipping rock units in the northwestern portion of the dome form a semicircular pattern of surface ridges that can be recognized on topographic maps and satellite images. The southeastern portion of the dome is not visible because it has been covered by sediments of the Karoo Supergroup. 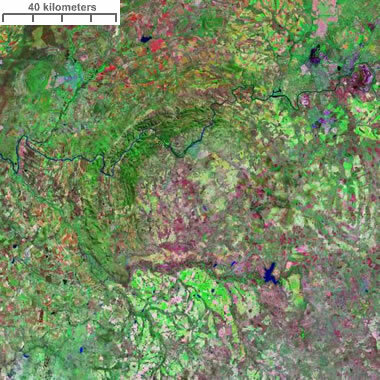 You can clearly see parts of the northwestern half of the Vredefort Dome in the Landsat image on this page. It can be recognized as a roughly semicircular pattern of concentric ridges. The Vaal River can be seen traversing the northern part of the structure. In some areas the course of the river forms an arc in map-view where it is confined to a valley between the uplifted ridges. Enlarge the Landsat image for a detailed view. Complex impact crater: The Vredefort Impact Crater is a complex crater. In the formation of a simple crater, a bowl-shaped depression is produced when an impact pulverizes the target rock and blasts much of it out over the surrounding terrain. In a complex crater, a central uplift is formed in the instant after the impact, when the material in the bottom of the crater attempts to return to a state of gravitational equilibrium. Public domain image created by NASA. Impact craters range from small simple craters to larger complex craters. Simple craters are bowl-shaped depressions formed when the force of an impact breaks up the target rock and ejects it out over the surrounding land (see illustrations on this page). Complex craters have additional structures that might include: A) a central uplifted dome; B) a shallow, flat floor covered with infallen ejecta; C) a concentric ring of ridges around the central uplift; and, D) terraced rims. The Vredefort Impact Crater is a complex crater. It may have had all of these features when it formed, but they have since been weathered and eroded away. Today it still has a central uplifted dome surrounded by a concentric ring of ridges. These are visible in the deformed bedrock that was once below the original crater floor. 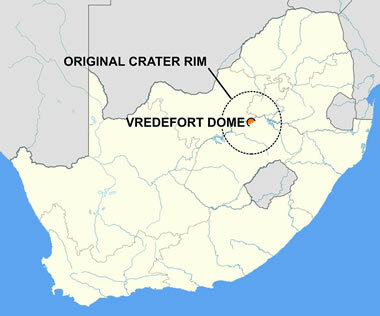 The asteroid that produced the Vredefort Crater is thought to have been between about 5 and 10 kilometers in diameter. The reason that such a small asteroid was able to produce a crater that is 300 kilometers in diameter was its velocity. It is thought to have been traveling at a rate of about 20 kilometers per second. The impact of a dense object at that velocity would have vaporized tens of cubic kilometers of rock in an energy-intensive explosion. This is how a small asteroid was able to produce such a large crater. The Vredefort Dome has been selected as a UNESCO World Heritage Site. The intent is to develop legislative, social, and physical provisions that will conserve and manage this unique natural history site for education and scientific study.